Now that Apple has signed deals with the major labels and has started iTunes Radio, the Cupertino based tech giant is now working to sign independent labels. According to the Wall Street Journal, Apple is willing to pay more than what rival Pandora pays for the same music. Apple's deal with each record label gives the latter a payment for each time one of its songs are played, along with a percentage of the ad money Apple receives. The Journal was able to review Apple's contracts for independent labels and found that each time a song is played, the label receives .13 cents plus 15% of net advertising revenue, although that chunk of change is parceled out depending on the label's share of the music played on iTunes Radio. This is higher than the .12 cents that Pandora pays. The next year, the rate goes up to .14 cents and 19% of ad revenue divided by the label's share. This is a little different than the deal signed by Universal, Sony and Warner. Those big labels are being given advances by Apple against future royalties. In addition, Apple pays the music publishers twice the royalties than what its rival offers. In certain circumstances, Apple will not make a payout. Royalties are not paid out for songs already in a listener's iTunes library, or for songs involved in special "Heat Seeker" promotions. Also exempt from royalties are songs that are stopped before they play for 20 seconds. Unlike Pandora, which has nothing to sell along with its streaming music service, Apple might be willing to give up some profits in order to get listeners to buy the tracks they like from iTunes. 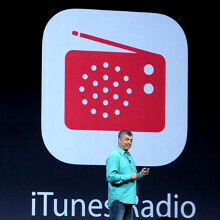 Apple also can use iTunes Radio to sell devices like the Apple iPhone. I'm excited to use it :-) Pandora have so little songs which is why I use Slacker. It looks like apple is really making an effort to make this successful . I really like it, so far. The stations stick a lot closer to what you originally asked for, and the ads are minimal, less obtrusive, and well spaced. I removed Pandora from my iPhone because it is downright awful, in comparison.